Ever wondered what to do with all of those beautiful, tea stained tablecloths, pieces of lace and vintage barkcloth? A truly talented friend created two gorgeous pennant banners from collected vintage tablecloths, pieces of lace, linen and barkcloth. This clever mama has an eye for detail and design and embarked on a quest: to source vintage. My friend scoured flea markets, thrift shops, estate sales (“It’s all about the hunt,” she said.) and a local fabric store to slowly collect the perfect bouquet of cabbage rose, robin’s egg blue, and embroidery threaded rosebuds. Once home, my friend arranged the cloths; she mixed and matched until the perfect pennant- many times over, was completed. The snapshot captures her vintage crafted beauty. 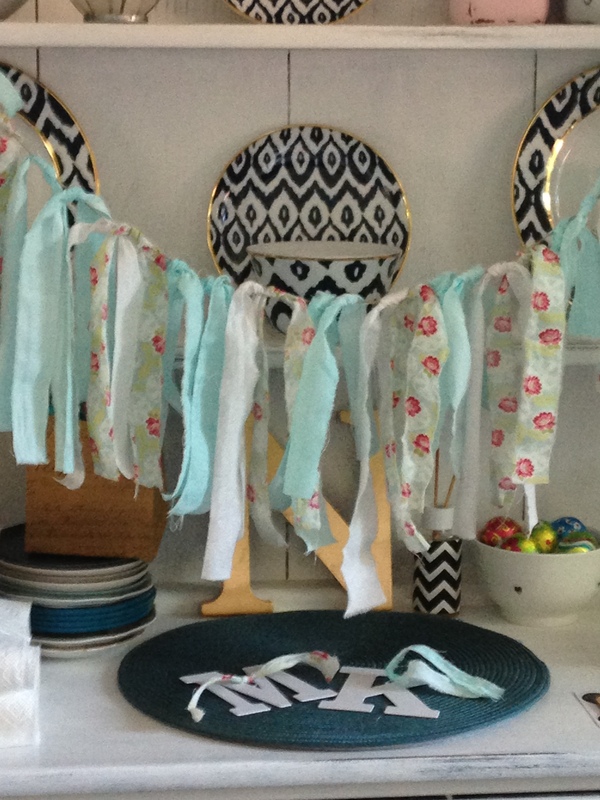 Collect vintage tablecloths and pieces of lace. Visit your fabric shop for a swatch of linen. The dimensions of the triangles are nine inches in length by seven inches across. From there, she created a triangle template onto cardboard. 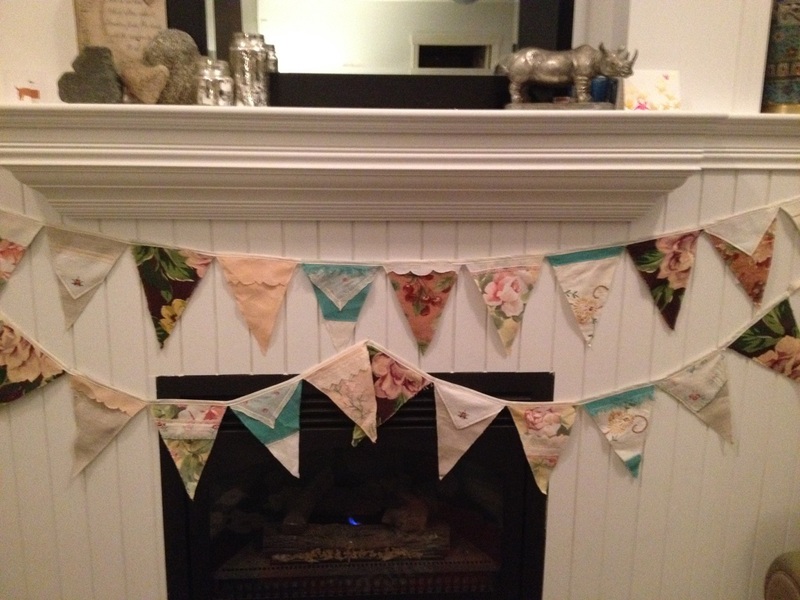 Cut out each fabric pennant. The pennants featured above are double sided. Overlay pieces of lace or embroidered cotton, if desired. My talented friend used seam binding as the “string”to sew the pennants onto. I’m begging for the banner featured above. If you don’t own a sewing machine, recreate the “ratty tatty” number that I managed to fashion. It’s a completely different “look~” hold the laughter, please. Simply select bespoke fabrics, rip strips of cloth and tie each ribbon of fabric onto the desired length of twine. Gather and swag your gorgeous banners from an outdoor tent, ceiling, or hutch. Weave in fairy lights. Too chic. Or make a quilt with the scraps…. One can create a beautiful quilt with the addition of vintage fabrics. Even quilted pennants would be gorgeous. The pennant banner is a fairly “easy” beginner’s piece and could be hung from here to there. You MUST join the craft challenge I joined – you’d be awesome! Aw~ I’m a very “simple” gal but I “like” a challenge. Please fill me in and “thank you” for inspiring me. Check out today’s post. It has all the info. Do it!